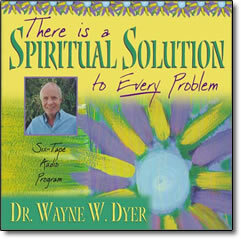 There is a Spiritual Solution to Every Problem – CDs by Wayne Dyer – Discount! In this inspiring new program, bestselling author Wayne W. Dyer shows us that there is an omnipresent spiritual force right at our fingertips that contains the solution to our problems — from ill health, to financial worries, to relationship difficulties. Drawing from various spiritual traditions, especially from the prayer of St. Francis of Assisi, Dyer helps us unplug from the material world and awaken to the divine within. With his trademark wit, wisdom, and humor, bestselling author and lecturer Dr. Wayne Dyer, explains how we can evolve from the lowest level of consciousness (ego) to the highest (unity). Dr. Dyer starts out with a challenge: “You don’t have any problems, you only think you do.” He goes on to illustrate how the mind can control both physical and emotional well-being–all one has to do is create healthy, positive molecules and move away from negative thoughts. He also relates stories from real people, as well as anecdotes from his own life, to show how the presence of love in the face of hate can nullify all negativity.